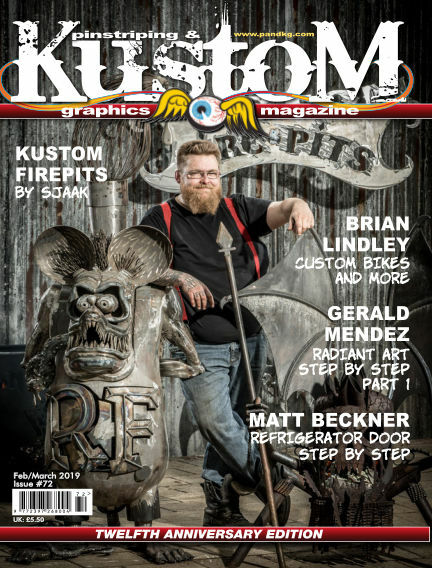 In this issue of Pinstriping & Kustom Graphics Magazine : Our fabulous 12th Anniversary edition is packed full of inspirational art and artists, how to from Steve Chaszeyka for aspiring pinstripers, with a multi media Fridge project from Matt Beckner with airbrushing and pinstriping, plus the first part of the phenomenal Gerald Mendez Radiant Art. We take a look at the auto art of John Rowley, Andy Saunders’ latest kustom vehicle, and investigate some rotten apples! All this and so much more! With Readly you can read Pinstriping & Kustom Graphics Magazine (issue 72 Feb/March 2019) and thousands of other magazines on your tablet and smartphone. Get access to all with just one subscription. New releases and back issues – all included.